After hosting two “Cheddar-offs” while living in Pittsburgh, my husband and I are determined to find and sample the BEST Wisconsin cheese from the 100+ cheesemakers in this great state. “What’s a Cheddar-off,” you ask? It is a cheese competition, where we tasted and ranked cheese from New York, Wisconsin, and Vermont with our group of friends, who had their own cheese preferences based on where they grew up. One friend from the Ukraine was deemed “neutral,” so he acted as the Cheddar-off administrator (cutting and serving the cheeses). Sadly, Wisconsin cheese came in last in the first competition, as we did not control the level of sharpness in all cheese represented. This lead us to host the 2nd Cheddar-off, where we had trusted one friend with purchasing all of the cheese, this time selecting sharp cheddar only. Yet again, Wisconsin cheese surprisingly did NOT take the top spot. New York cheddar took that honor both times. This led my husband and me to believe that Wisconsin keeps the BEST stuff hidden away within state lines, thus starting our cheese ventures. The latest road trip brought us to Curtis, Wisconsin, located outside of Abbotsford. The happy, bright yellow store shines like a cheddary beacon in the lush green North Central Wisconsin farmland. It was Sunday, late morning, and there was a steady flow of fellow cheese lovers in the store. We talked with the employees to learn that the Blue Jack cheese (blue cheese and monterey jack blend) was a patented Nasonville Dairy cheese. We ended up buying some Blue Jack slices and a 6 year old cheddar, packed them in our cooler, and headed home, looking forward to savoring our latest finds. The aged cheddar and Blue Jack did not disappoint! It was semi-hard, kind of crumbly when you cut into it, sharp, earthy deliciousness. It didn’t even need crackers or bread – it stood well enough on its own. The Nasonville Dairy 6 year old cheddar even became dessert one night, washed down with a cold beer. I think it will be tough to compare other cheddars to this one! The Blue Jack was excellent on homemade hamburgers with an Capitol Oktoberfest beer. Did I mention I love food?! Did you meet and eat a cheese that you really loved? Let me know about it! This entry was posted in Cheese and tagged Cheddar cheese, Cheese, Wisconsin, Wisconsin cheese by Cathy O. Bookmark the permalink. I don’t think I realized you live in Wisconsin too!!! I LOVE cheese! I’m so glad I’m not lactose intolerant because I don’t think I could live without it….especially sharp!! I love blue cheese…I’m anxious to see if I can find some Blue Jack now!!! Awesome! I remember seeing your post about Heritage Hill…we went there as kids on a school field trip. Good times. Yes, cheese is such a staple at our house. We love it too! 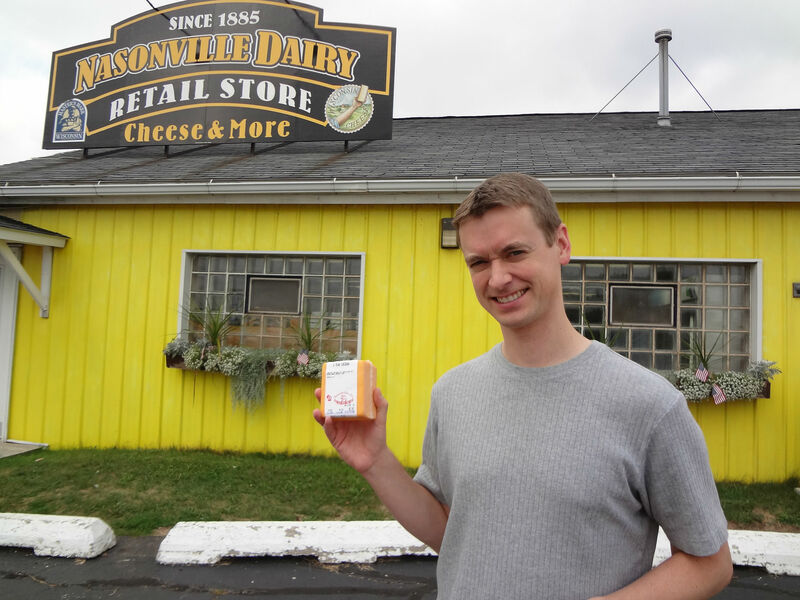 Simon’s Cheese in Kaukauna is a good place too…we need to go there on a Saturday when they are open. Woodman’s grocery store carries a lot of WI cheese too, but not sure if they have blue jack. I’ll keep my eyes open.